Dennis was at my side when I whipped the tea towel covering off these rising cinnamon rolls. What did he say? "Oh Yum" or "Are those for me?" "Oh, pretty patterns." And he is right. I have to do some experimental panels and I may well be inspired by how the neat spirals get distorted when you cook them. ... but my laptop is poorly-sick. It has a defunct wireless card and has had to go to hospital. Which would not be so bad except it coincided with the few weeks of the year where my retired husband needs his laptop for more than a short time each day to check emails and Amazon sales as he is marking Religious Education GSCE exams online as an external marker. So I have to share at awkward times of the day and I don't like it! (Blooper of the day: Some people just live together now and don't get married so they give birth to illiterate children.
. Anyway, that's my excuse for the lack of posting this week. Plus I had a mad flurry of posts last night on my C&G Blog so you can see I have been doing things. Apropos of nothing: I just got an email from the Quilt Show with a section on rotary cutting safety advising me never to cut more than an arms length away from me. How do I do that? The cutter is in my hand at the end of my arm. How does it get to ever be more than an arms length from me? Apropos of eye candy, at midnight last night ( I told you - sharing at awkward times!) I discovered the Fibrescene website which appears to be an almost endless source of eyecandy. I found it via Goggle images looking for fabric manipulation and got to Robert Hillestads knitted wear (Scroll down to find it), which together with Mary Giles' containers ( same page a bit further up) gave me a sudden burst of inspiration for an experimental embroidered panel and lead to rapidly firing sketches and notes on Zulu beaded shawls. African braided hair and Nigerian costumes. Why does this only happen in the early hours of the morning when I should really be asleep? Finally the picture of the flower relates to nothing in this post at all but I hate pictureless posts and it was the only nice picture I have downloaded on this laptop. It is the clematis in my garden. Have a happy day today. I went. I saw. I bought. I ran out of money and decided not to do the second day. Also, I was disappointed with the standard of quilts. Dennis wondered if it was because when I was a new quilter everything looked good and now I am more discerning. But, I have just reviewed my photos from the first time I went in 2007 and I do genuinely think that the show was much higher in quality. This year there were a lot of quilts - many of which were billed as beginner and were indeed decidedly beginner - from one quilting group. It smacked of 'filler display' and I wonder whether people were feeling the pinch and not paying the fee and postage involved in showing a quilt? I feel I cannot carp too much though as I never got round to showing one this year either - not that mine would have upped the quality to what I was looking for you understand, but it would have enabled me to moan with more credibility! After the show we went off the hotel in Hereford where I picked up a leaflet of tourist attractions. "Oh, Look," I said to Dennis. "The copy of the Magna Carta you were talking about is on display too!" I threw him the leaflet. "Yes," he said, "except the exhibition starts in June." "And its worse, It says here the Mappa Mundi we came here to see is not open until next week either." I swear the tourist information site I looked at just said it was open on Sundays from May *..... See: this is why travelling spontaneously is not a good idea! Oh well, the upside is that the shabby Indian Restaurant which is the first one we found in Hereford served great food at cheap prices. This morning we thought we might as well go and see the cathedral itself and found these modern stained glass windows. The texture begs to be embroidery doesn't it? * PS. I've just looked again - the site I went to in fact said it was open April - October on Sundays.... WRONG! Do not use http://www.culture24.org.uk for your tourist info. of course if the cathedral website had actually been more than a front page only and if their opening hours were on their answerphone.....! Anyone reading going to Quilts UK on Saturday or Sunday afternoon and fancy a quick coffee? (Or no coffee but a short period of shopping / quilt admiring in company?) Please email ne - surfer@talktalk.net with a contact number if you do. I love to plan travel. I don't mean I like to flick through a brochure and dream. I mean I like to download local bus routes for places I am going 8 months hence and to know the seat configurations on the plane I am taking. I like the fact that I know it costs about 4 pence more to go on the upper deck of the star ferry between Kowloon and Hong Kong Island as it does the lower deck. The planning is at least as good as the going. But that is not to say I am not capable of spontaneity. Last Friday I went for a meal out with a friend who was about to depart for Majorca on a golfing holiday. That and the Gaudi book I was flicking through implanted a sudden urging in me. We were not doing anything particular that weekend, lets just go to Spain! So I got home and went on line to book a flight to Barcelona the next morning. There were none. None at all. Not even very expensive last minute indirect ones. Darn. I was all set to go. Later, in the dead of night I awoke to the sudden realisation that it was a good thing there were no flights as my passport is in fact with the UK passport agency being renewed. And the next day when Dennis asked if I minded him putting on the Grand Prix - from Barcelona - that the penny dropped as to why there were no flights. "I think you should use your newly-acquired embroidery skills to make a modern version of the Mappa Mundi with your journey superimposed on it." Well what a great idea! Of course, I was not entirely sure what the Mappa Mundi looked like so I Google it. 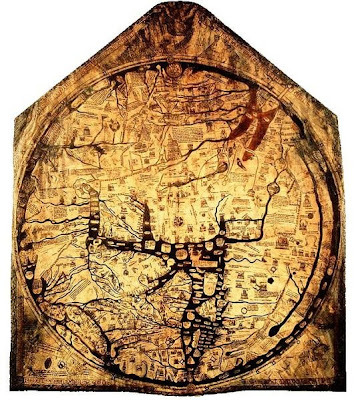 It looks like the picture above ( which actually doens't tell me a lot but it was the best one I could find) and guess where it is (or at least where the oldest one is as all Mappa Mundi means is Map of the World) - Hereford. And you know where Hereford is? Yup, 33 minutes ( thank you AA route finder) from The Three Counties Showground in Malvern, home of Quilts UK this weekend. So, I cancelled the hotel in Worcester, re-booked one in Hereford, not only allowing us to discover a heretobefore unknown place to eat there in the evening, but also to view the Mappa Mundi and the Chained Library exhibition for an hour or so before hotfooting back to the showground for day two of the show ( I reckon a day and half is perfect timing for Quilts UK anyway). Thanks Joyce! PS I am a lawyer. I like to use words like hence and heretobefore. Herein and aforemetioned are good ones too. PPS I am not sure that heretobefore is actually a word but I still enjoyed using it. Thank you for all your ideas about what type of project I should take on our travels with me. Apart from Quilt Pixie's innovative fabric postcards and make as you use bag they fell into three categories. First - English paper piecing. Well, yeah, I see where you are coming from but.... oh sorry, what was I saying? I fell asleep. I've done a few samples in the past but whats with all that paper?! I can see handpiecing - in fact this quilt, which was one of the first I ever made, has all handpieced blocks. I thought it strange that the general response seemed to be that if you were handpiecing it might as well be over paper. I did have a good time handpiecing this Mariners star on a train crossing the German/Holland border last year though. I just haven't worked out what do do with it yet! I may well handpiece some blocks with fabric as I go - but what to choose? 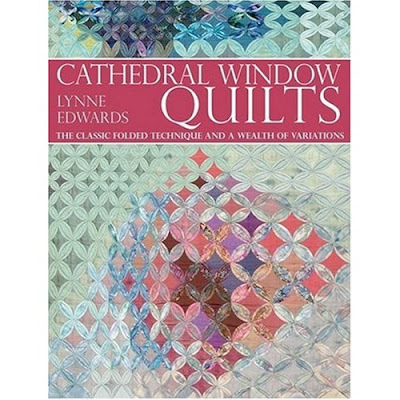 Secondly, cathedral windows - since I have this book I took another peek. I wonder about somehow making the centres out of ephemera I find along the way? I just haven't worked out how to do it yet. Then came the crazy quilting which actually was my idea too. Only I don't really like them. I mean I really like the idea of premade crazy blocks and making some more as I go along ( see above on handsewing foundation blocks). But, I don't like the Victorian mishmash of them - you know the, um, craziness of them. So I was thinking about how to do a sort of 'slightly on the flaky side' quilt, with lots of embroidery and some textural interest, but monochromatic and delicate rather than crazy. I was just working out how to do it when I looked up from my sewing machine and here was this picture. Made by the fantastic Pollie Uttley it is a clay piece inspired by Indian textiles and ever since I bought it I have periodic thoughts about translating it back into fabric. What do you think? 3. Is interesting enough and slow enough to last me three months. 5. Ideally is something that will allow me to take a basic kit then add in items I buy as I go around the world researching quilt shops but is not dependant on me finding specific products which may not be available. 6. Is portable so I can take small parts of it out with me for the day in my handbag. 7. And finally - to really push it - has a design which, if I feel so inclined, I can adopt to reflect design inspirations I spot as I travel. I'll give it a few days for this to trickle through people's blog readers and for me to get as many ideas as possible then I'll share my initial ideas. I am almost at the end of the Patchwork and Quilting City and Guilds. Which is just as well as I am a term into the Embroidery City and Guilds and really doing two at once is not what you are meant to do! China/ Hong Kong. Based on Chinese jade and a giant Buddha statue. Printed extravorganza and painted fabrics. New Zealand. Made out of painted and stitched Bubble Wrap with reverse applique. Australia. Scraps of Aboriginal fabrics begged from a friend (thanks Lesley - owe you one!) and with a design based unimaginatively on the Opera House. Made with what little I had to hand in Bath. Japan is still to come. Remember when you were a kid and you went to town on Saturdays to spend your pocket money on frivolous things? I rarely go into the shopping area of my home town - its easier to pick stuff up when I am working in bigger cities. But on Saturday I ran out of Pritt Stick ( a glue stick for anyone who is not familiar with the brand name) and popped in. Thinking of my teenage years I decided to walk down to the indoor market which, now I am older and snobbier ( and give myself more pocket money) I avoid as it is cheap and nasty. But, nostalgia got the better of me and I was reminiscing about how Lisa and I would go and buy Constance Caroll make up. A similar stall remains but times seem to have changed as of the three fifteen year olds giggling over the lip glosses two were at least six months pregnant. Still, the trip was worth it as opposite is a yarn stall. ( When I was a teenager, 'yarn' was 'wool' and 'thread' was 'cotton' but now I am a quilter so I know better!) It had buy one get one free on fancy yarns and whilst I don't knit I do couch down or embroider with yarn, so as you will have guessed from the photos I had to get some. And some stranded cottons to match. Oh what fun it is to spend pocket money on a Saturday morning! I had to re-organise my textile bookshelf last week because the pile at its foot which would not fit on the shelves annoyed me. I removed the sketchbooks from the top shelf and placed them on these alcove shelves which previously held a collection of travel books (now in the attic). Then I had to decide how to orgainse the textile books. I wanted the shelves to look as neat as possible as this is my thinking room which I like as uncluttered and restful as possible. So a system like alphabetical which leaves books all higgledly piggeldy to look at was not going to do it. Yet both my left and right brain wanted a say in the process. And within categories by colour of the spine and within colour by height. Makes sense to me but what do you do with yours? If, like me you love to browse other people's shelves, you can see all my books in closer pictures in this Picassa Album. This morning we took a Sunday drive out to Cedar Farm which is a misleading name because it is more arts centre than farm - although it does have a small area with animals for children to look at - which is why Dennis likes going although he remains disappointed that for some time there have been no rabbits. However, he got Brownie points today when he pointed out one, new, gloriously coloured bird ( which would, as you can see, not stand still for photos) and said, "Those would make good colours for a quilt." There are several buildings with artists studios and also a good crafty gift shop and art store. There is a cafe and also a coffee house in an industrial building which they make homely with squishy sofas and baskets of magazines. And blueberry cheesecake muffins. It is a good place to hang out and read and also to do a bit of sketchbooking. I am trying to find time to do more of that and to build up my lamentably lacking skills with art products. Today I took a small set of watercolours with a little bottle of water and a tin of aquarelle crayons. I got there and could see nothing to draw until I spotted a dying dandelion head on the floor. Here are my resulting pages. The last page is a section of the first page and I got the idea from reading Red by Jan Beaney and Jean Littlejohn which is one of their embroidery pamphlets ( you can see the series here) while I was there. "Really?" I said, are you sure - they are quite expensive considering they only have 28 pages. "I know" he said, brandishing his 850 page book he bought for £4.50. "But two of those books is the same as I would have paid if I'd come to the show with you." "So you are buying me the books as kind of insurance so you don't have to come into the quilt show?" He always gets caught out in his sneaky schemes!